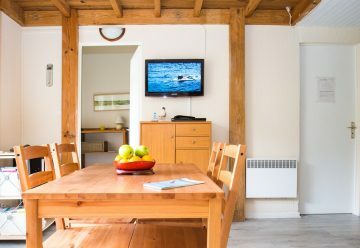 We provide clients with an alternative to the standard surf camp with our private surf apartments and surf villas that cater for everyone’s needs and budgets. If noisy houses and late night partying isn’t really your thing and you just want to enjoy a relaxing surf holiday, whilst really being able to focus on improving your surfing, then our private surf camp apartments and surf villas are what you need. We can help you choose from our selection of surf apartments and surf villas, ideal for couples, groups of friends or families for amazing prices. We can cater for all sizes of groups, ranging from 2 persons up to 12 persons. All of our properties have been hand picked for you by us. Our two main criteria are location and comfort. All of our apartments are right beside the beach, yet within a 5 min walk from the shops, restaurants, bars and clubs. 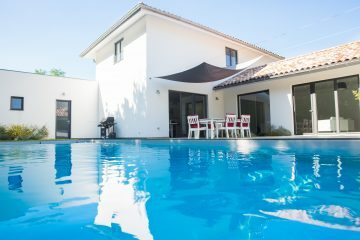 The surf villas are in various equally strategic locations in and around Seignosse and Hossegor. If you’ve chosen one of our surf apartments then you won’t necessarily be needing a car as we provide bikes in the surf camp package. However, a car is recommended, if you want to go on a few cultural visits, such as Biarritz, San Sebastian, Saint Emillion or Bordeaux. Have a closer look at our Activities page to discover more great destinations and things to do whilst you are here. If it’s the car free option that you want, then we can organise your airport / train station transfers for you. 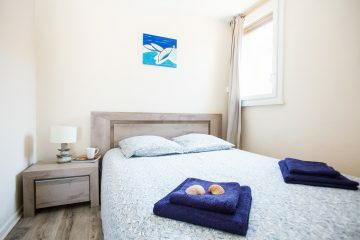 Once comfortably settled in your accommodation with your towels neatly folded on the ready made beds, all that you’ll have left to do is to organise when you want your 1st surf lesson. Your surfboards and wetsuits will be given to you after your first introductory lesson. The surf course, which consists of 5 two hour surf lessons or surf guide sessions, will allow you to take a day or two off, to unpack, settle in and to do some cultural site seeing. However if you are surf mad then you can just book as many extra lessons with us as you like. After the lessons the rest of the day is yours to continue surfing or lazing on the beach or to get off and do some more sight seeing and cultural visits. Surf holidays really don’t get any easier ! It’s all about location here at Boardingmania, as our private surf camps are right next to the beaches of Hossegor, the surfing mecca that is at the heart of the European surf scene. The ‘Hossegor, Seignosse and Capbreton’ area also boasts some of the best beach breaks in the world. Every year the top 34 surfers in the world come to the area as part of the World Tour. If you find yourself getting too surf obsessed then take a break and visit the local markets, cycle through the beautiful pine forests or just opt for lying on the endless beaches, reading, bathing and soaking up the sun. For the more active why not try your hand at Seignosse’s world renowned golf course, play tennis or go surfing again! Otherwise just loll on the sun soaked terraces in any one of the numerous cafes and restaurants in Seignosse. Or you can shop till you drop in any one of Hossegor‘s numerous surf shops or factory outlet stores. Then there’s local cow games (football against cows – you have to see it to believe it! ), concerts, clubs and bars. Lots to do for everyone, whether you’re with your friends, family or partner. Visit our Activities page to get some more great ideas for a fun day out. Nearest train station in order of distance; closest Saint Vincent de Tyrosse, Dax, then Bayonne, Bordeaux is the furthest. Saint Vincent de Tyrosse is the closest and is only 4hrs from Paris and 7hrs from Brussels! Nearest airports from Biarritz, Pau or Bordeaux in that order. Exit no. 8 (Hossegor/Capbreton) off the E70-N10 motorway and follow signs for Seignosse/Hossegor. Exit no. 16 (Lannemezan) off the A64 and follow signs for St. Lary-Soulan. For the car free surf trip you can organise for us to pick you up at your point of arrival in our spacious 9 – seater van by your banner waving Boardingmania representative who will drive you to your apartment or villa (via the supermarket if you want to stock up straight away or via the beach if you can’t wait to get in for a surf).